To begin your inspection of a tree, head right to its base. If the lowest part of the trunk is obscured by ground cover plantings, pull them back to gain a better view. Here, either hollow cavities or the presence of mushrooms could indicate a serious problem. Move on to checking the ground around the tree’s drip line—that is, the circumference under its canopy. Look for roots protruding up from the ground. Visible roots are not problematic in and of themselves, but if there’s other evidence to suggest that the tree is struggling, then protruding roots might mean that the tree is on the verge of toppling over. 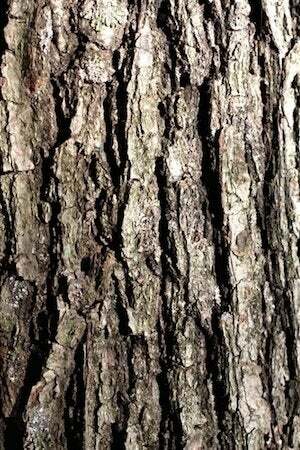 If you encounter a tree that’s missing a long streak of bark along its trunk, it was probably struck by lightning. Being composed mostly of water, trees are excellent conductors of electricity. When lightning hits the canopy, the bolt careens all the way day down to the roots, boiling sap in its wake and creating explosive steam. If there’s damage to one side of the trunk only, the tree might fully recover. But if bark’s missing on multiple sides, it’s likely that the tree isn’t going to survive. Since dead branches are the first to fall, it’s wise to remove them from trees growing close to the house. 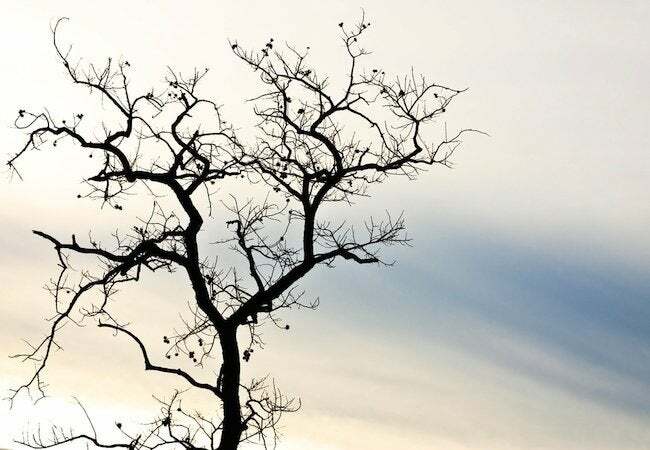 On deciduous trees, dead branches either have no leaves or brown leaves (in the winter, this is tough to judge). With evergreen trees, look for brown needles and the absence of bark. If you successfully identify dead branches—and if those branches are easily accessible—go ahead and prune. Otherwise, call in a specialist. When trees have two or more trunks, be sure to look closely at the point where they meet. U-shaped connections between trunks are usually not a problem. A tight “V” shape, however, suggests a weak spot. If you’re worried about a particular tree, you can have a steel or elastic cable installed to keep it from splitting apart in high winds. But to be clear, this isn’t a project for the do-it-yourselfer; hire an experienced pro. If any of the red flags discussed leave you uncertain about the health of a tree on your property, it’s best to call in a certified arborist. Besides having training and hard-earned knowledge, arborists also have specialized tools they can use to make sophisticated diagnoses far beyond the scope of this article. If you have work done on a tree, don’t let any of the workers climb the trunk by means of leg spikes. With every step, they’d be punching holes in the tree that would make ideal portals for harmful pathogens. The damage done by leg spikes might not be immediately evident, but it could eventually prove fatal to the tree.